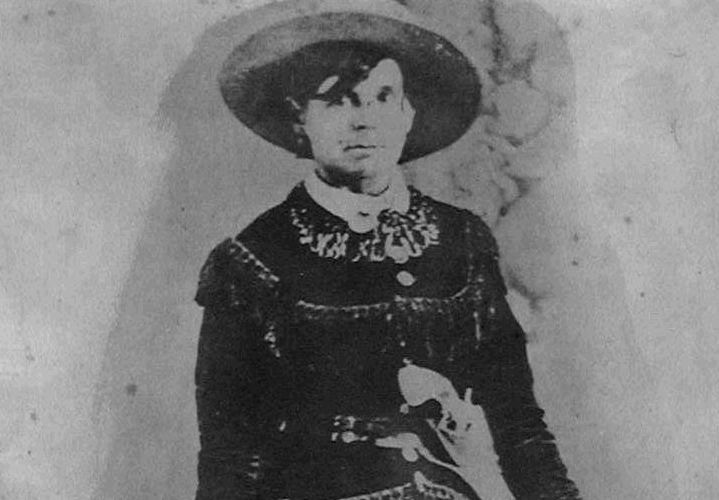 The outlaw was born Myra Belle Shirley at Carthage, Missouri, USA on 5 February 1848. The daughter of a wealthy publican, she married Jim Reed, a horse thief, in 1868 and had two children. In April 1874 Jim Reed robbed a stagecoach, and Belle Starr was charged as an accessory (although the charges were later dropped). Four months later, on 6 August 1874, a deputy sheriff killed Reed near Paris, Texas. In 1878 she moved in with Bruce Younger whose relations rode with Jesse James. (search the article about him). On 5 June 1880 she married Samuel Starr, a Cherokee Indian. Three years later, both were convicted of horse theft and were given a year in prison by Isaac “Hanging Judge” Parker at Fort Smith, Arkansas. They served nine months. After being released they continued to rustle cattle and steal horses. Lack of evidence prevented her prosecution and she denied culpability in interviews, telling one reporter on 7 June 1886, “Next to a fine horse I admire a fine pistol. You can just say that I am a friend to any brave and gallant outlaw.” Samuel Starr was killed in a gunfight on 17 December 1886 and in July 1887 Red Indian Bill “Jim” July, 15 years Belle Starr’s junior, moved in with her. On 3 February 1889, two days before her 41st birthday, Belle Starr was shot and killed in an ambush near her home in Youngers’ Bend, Indian Territory (now Oklahoma). The identity of her murderer remains unknown. Sharecropper Edgar J Watson, an escaped murderer from Florida, was tried for her murder, but was acquitted. He died in 1910. Another suspect was her son James Edwin (Edward) with whom she was said to have had an incestuous relationship. He became a bootlegger and died in a saloon fight in 1896. Her daughter, Pearl, became a prostitute in Fort Smith and died in 1925.